The Chinese have set a mole loose inside the CIA, compromising American efforts to ensure that their home-grown high-tech companies lead the world in research into quantum computing, the ultimate in data processing. When CIA Deputy Director of Operations John Vandel assembles a small group of experienced resources to identify the mole known to the Chinese as Rukou, The Doorway, CIA officer Harris Chang isn’t sure whether Vandel’s operation will be the case of his career or it will leave him on the outside looking in. As the internal struggle between China’s Ministry of State Security and the People’s Liberation Army unfolds around Rukou’s activities, will Chang be caught in the crossfire? David Ignatius is the bestselling author of numerous thrillers, including Body of Lies, which was made into a movie by Ridley Scott starring Leonardo DiCaprio and Russell Crowe. As a journalist, he covered the Middle East and the CIA for the Wall Street Journal and the Washington Post. His novels have drawn praise from such luminaries as General (Ret.) David Petraeus, former Secretary of Defense and CIA Director Leon Panetta, former CIA and NSA Director Michael Hayden, and prominent CNN host Wolf Blitzer. 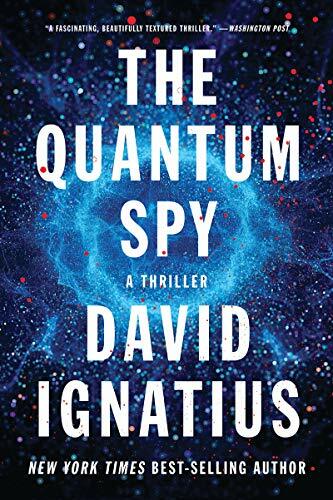 Given the author’s background and his access to such high-level expertise, then, The Quantum Spy presents the internal struggles of Chinese intelligence agencies and their efforts to penetrate their American counterparts with a high degree of verisimilitude. His research into the current state of quantum computing, mentioned in his Acknowledgments, lends the same level of believability to the struggle over control of quantum computing and its phenomenal potential for code-breaking. The resulting thriller, however, is somewhat underwhelming in its delivery. Ignatius touches on the hardware side of quantum computing by taking us to a research lab on the west coast that’s leading the way in what’s known as “adiabatic quantum computing, which people often call quantum annealing,” a technology that involves lowering the temperature of quantum “chips” to near absolute zero. How the software side works, though, remains something of a mystery despite the fact that the device will successfully analyze key intelligence data at a critical point in the story. It comes off as a science fiction “magic box” more than as a realistic next step in super-computing. Also somewhat puzzling is the relationship between Vandel and Harris Chang, and their reaction to a patently transparent attempt by the Chinese to compromise the latter, given his Asian American heritage. Notwithstanding the fact that readers are warned of the move in advance, we could perhaps be forgiven for thinking that it was fairly predictable, and the resultant revulsion toward Chang as an apparent traitor is rather confusing. It was completely lame and obvious to us; why is it so traumatic and crisis-inducing to these characters? Doesn’t this happen in the spy world all the time? Why aren’t they rolling their eyes and shaking their heads the way we are? Ignatius comes close here and there. Chang, whose agitation is described as what “a decent person feels when he is asked to do something wrong,” reflects at one point that everyone “has a secret in his past. Sometimes it’s so well hidden, we don’t know ourselves what the secret is.” An interesting and somewhat George Smiley-like thought, coming from someone who digs out secrets for a living. At the end of the day, though, Ignatius’s characters are just not accessible enough to us. The twists and turns of emotion they experience as the story unfolds come off as puzzling or out of character rather than believable. The bottom line on The Quantum Spy is that it’s a readable, reasonably harmless spy thriller that provides an interesting look at Chinese intelligence and the race to control the digital world, but it’s a long way from the work of such masters as John Le Carré and Len Deighton. It skims the surface of two very interesting subject areas without providing enough satisfying depth to ring the bell as a thoroughly convincing thriller. Michael J. McCann’s crime novel Sorrow Lake was shortlisted for the 2015 Hammett Prize for literary excellence in North American crime fiction. His latest novel is Persistent Guilt, the third March and Walker Crime Novel.